President Obama unveiled a “Roads, Railways and Runways” infrastructure proposal today in Milwaukee. The proposal is for a six-year, $50 billion plan to create jobs by improving and expanding 150,000 miles of the nation’s roads, 4,000 miles of railways and 150 miles of runways. Mr. Obama also called for what the White House is describing as an “infrastructure bank” that would focus on paying for national and regional transportation projects by pooling private money with public investment. He said the bank would eliminate a patchwork system in which transportation projects are financed through Congressional earmarks rather than based on merit. The White House is proposing to cut tax breaks and existing subsidies for oil and gas exploration and production as one way to pay for the plan, but officials said Mr. Obama is open to other ideas. Historically, transportation projects have been paid for largely with dedicated taxes like those on gasoline. Joining Obama at the lakefront festivities were AFL-CIO President Richard Trumka, Labor Secretary Hilda Solis, Transportation Secretary Ray LaHood, Labor Council Secretary Shelia Cochran and Wisconsin AFL-CIO President David Newby. It’s time for JOBS. For economic patriotism. I want to see the words “Made in America” again—because it’s time to start exporting the things we make, instead of jobs! “As the American people, facing near double-digit unemployment, mark Labor Day by asking, where are the jobs, the White House has chosen to double-down on more of the same failed ‘stimulus’ spending,” Boehner said in a prepared statement. Oh, wait, no he didn’t. 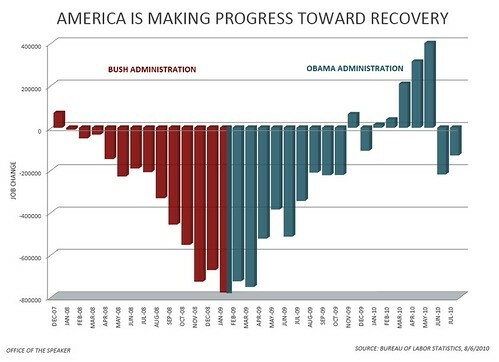 All data show that the stimulus worked but was not enough.